And so the end of year arrives and with it our last show of 2010. The last of our end of year shows, this one follows the 2009 best of mix I did last year though instead of spreading across two shows I tried to squeeze all I could into one session. Make no mistake, despite the naysayers and the doom and gloom surrounding the music industry in general, for me 2010 has been a rather good year music wise. On one side there’s seemingly more music than ever, and with that comes a certain lack of quality control. On the other, this lack of quality control and breakdown of the traditional models within the industry has I believe given various labels and artists in the ‘underground’ a lot more potential for flourishing. As the old saying goes, you’ve just got to look closer to find the gold among all the noise. I originally had 160 odd tracks earmarked for this show. A couple of days of ruminating and trying things out and I managed to keep it down to 60 or so, as well as the mini feature on All City Records, my label of the year (as you should know by now – they did two guest mixes for us earlier this month). In the process of putting the mix together it first occurred to me that if you consider the amount of music I received this year for the show (at a guess I’d say 500 odd releases, maybe even more) then there really is a big job of sifting through everything to find the stuff that’s actually worthy of a best of mix. Even then I had to leave stuff out that I wished could have been fitted. The criteria (if you will) was a mix of what I’d played on the show in the last 12 months and which I considered to be well above par, as well as tracks that have been staples in my DJ sets and tracks from albums that have barely left my portable player all year. The result is the following tracklist. Apologies to those I missed, but if anything it’s the perfect excuse for you to go over all the shows we’ve put out in the last year (hint hint). I also tried to avoid too much duplication with the previous two end of year shows from Primus Luta and Raid System. So that’s it for 2010, another year under the belt and onwards. 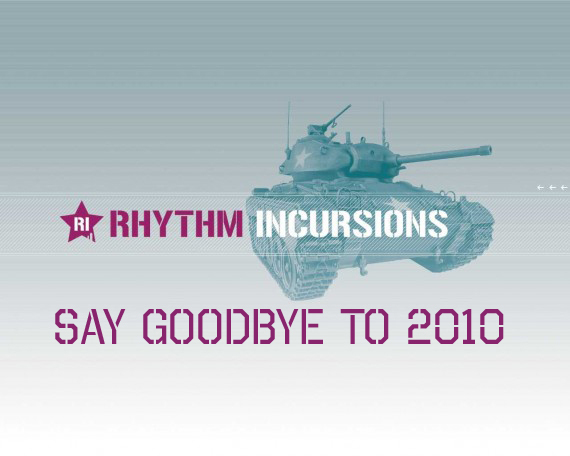 Rhythm Incursions has seen a lot of changes this year – new website, new presenters, new regular guest series. It’s been an absolute blast, and I want to thank everyone who’s made the show what it is and who works out of their own time towards continuing to make this one of the finer podcast series out there. In no specific order much love and thanks to Primus Luta, XLII, Broken Haze, Dday One and Leeor at FoF for their work. A big thank you as well to all the labels, artists and PR who send us stuff and take time to talk to us, sometimes even bowing to our pressures for guest spots. Among them (too many to mention) special thanks to Olan at All City, Gordon at Mooncircle, Marcus at Planet Mu & Hyperdub, Flip at Error Broadcast, Melissa at Tailored, the Outpost, Alex Nut and Alex Chase. Lastly big thanks to my close friends and inspirations Om Unit and Vinilificio. Right then, enough of the chatter. I’ll let you enjoy the mix. It’s roughly 2h15, with the first 2 hours taken by the mix and the last 15 minutes the All City records megamix celebrating some of their releases from 2010. I was intent on doing a proper megamix of all the releases, but just couldn’t due to time and other engagements. Still this should give you the last push to check their stuff if you haven’t yet. No talking, all mixing and music! As always stream and/or download below, or simply subscribe to the RSS/iTunes/email. The playlist is so long I can’t find the energy of linking all the labels/websites this time so PLEASE if you like what you hear than check the playlist and go out there and support the artists and the music. You can browse all available shows by artists on this page, and all previous shows have full, linked tracklists. Love and blessings, see you in 2011! This entry was posted on Thursday, December 30th, 2010 at 11:31 am. It is filed under Podcasts, Presented by Laurent and tagged with Wrongtom, Dam Funk, The Bug, Bullion, Flying Lotus, Take, Fulgeance, Ras G, Scuba, Onra, Exile, Lorn, Nocando, Paul White, Mount Kimbie, Jneiro Jarel, Om Unit, Foreign Beggars, El P, Robot Koch, FaltyDL, Roots Manuva, Dimlite, Dibiase, Tranqill, Untold, Four Tet, Mala, Jose James, Breakage, Helixir, Teebs, Quarta330, Darkstar, Aardvark, LV, All City Records, Illum Sphere, Bonobo, Soul Litchfield, Mux Mool, Kuedo, Daisuke Tanabe, 2phast, Aloe Blacc, Musinah, Yosi Horikawa, Lazer Sword, Sepalcure, Pariah, Electric Wire Hustle, Autechre, Oriol, Jordan Rockswell, JSBL, Joe, Caribou, Arp101, Blundetto, Space Dimension Controller, Mike Gao, Kan Kick, Chanes, Maddslinky, Krystal Klear, Andreya Triana, Recloose, Digi D'Allesio, Harmonimix, Boddika, Jazzneversleeps, Miguel Atwood Ferguson, Afrika Hitek. You can follow any responses to this entry through the RSS 2.0 feed.